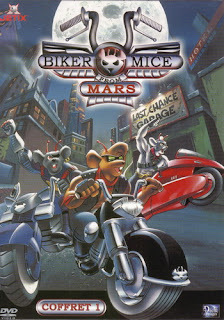 In the wake of the original Turtles cartoon’s success, there was a glut of shows featuring anthropomorphized animals with crazy sci-fi origins. Whether they’re created through science or aliens from (or on) another planet, these guys all owe their creation to the Teenage Mutant Ninja Turtles. Though none of them achieved the success of their forefathers, there’s no denying they were just as weird. I never bothered to watch these in their original runs, seeing them as inferior imitations, and I’m not bothering to watch them much more now, only watching the first episode of each shows for this list. I’d wager this is the most well-known show to follow in the Turtles’ path and stays as close as possible to the original formula. A scientist working with integrating aquamarine animal DNA into human genes, his evil partner uses it for evil purposes, and the scientist’s four sons need to rescue him. They’re injected with shark DNA and turn into the Street Sharks. That’s about all I got from the show – the four brothers have the most generic personalities – one’s lazy, one’s brainy, one’s athletic. I’m not sure what the last one’s trait is, and I don’t think I caught a single name of theirs. As Street Sharks, they swim through the streets causing thousands of dollars in infrastructure damage, while eating anything that gets in their way. They all talk in the same 80s surfer lingo as the Turtles, but with shark references. Artistically, this show’s a mess. The animation is terrible, the designs are dull, and there’s a weird Seinfeld-style riff that goes through the episode. And what’s with the misplaced environmental message? “Jawsome?” No, far from it. I feel like when this show was created, the writers tossed some dice in a box and went with what came up. 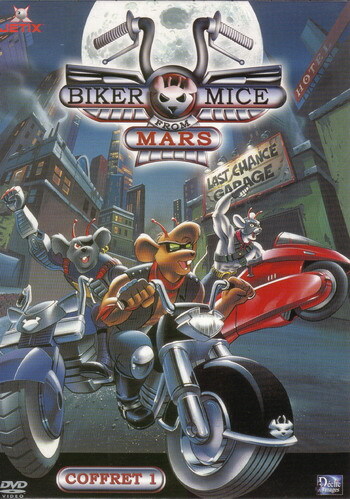 Biker Mice from Mars is about as basic a concept as you can get; The planet Mars is populated by mice people and was taken over by Plutarkians, which look like big fat bipedal fish. They escape the planet on a ship that looks like a big motorcycle, crash on Earth, and make friends with an April-like repair garage owner. The leader of the Plutarkians, which commanded the bikers’ ship to be shot down, is also somehow a huge business owner on Earth at the same time. I’m not sure how that worked out, but whatever. They’re on our planet trying to steal all the resources like they did on Mars, and somehow decided to start in Chicago. I guess with all the other crap that goes on there no one would know what they’re doing? 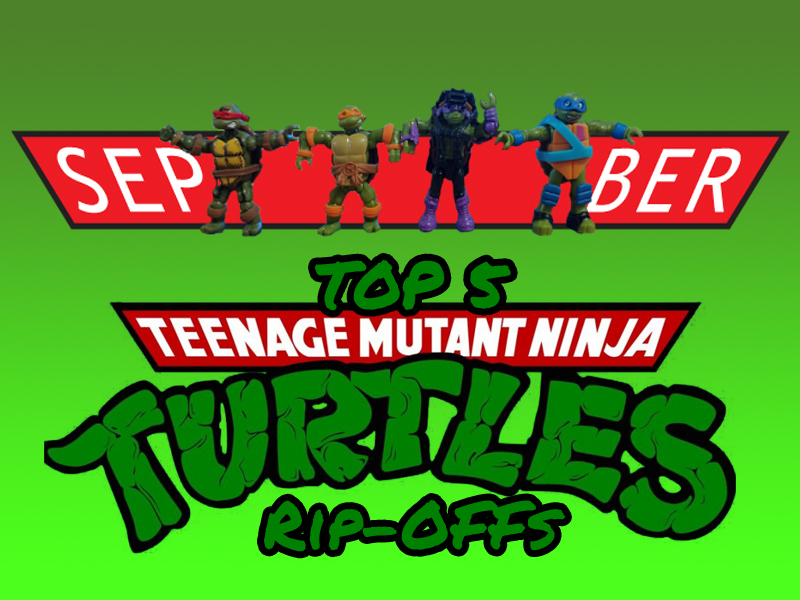 There’s a bunch of terrible 80s references – the big bad of the episode is a total rip-off of the Terminator and they even crack a Turtles joke. Have some respect, you young upstarts! 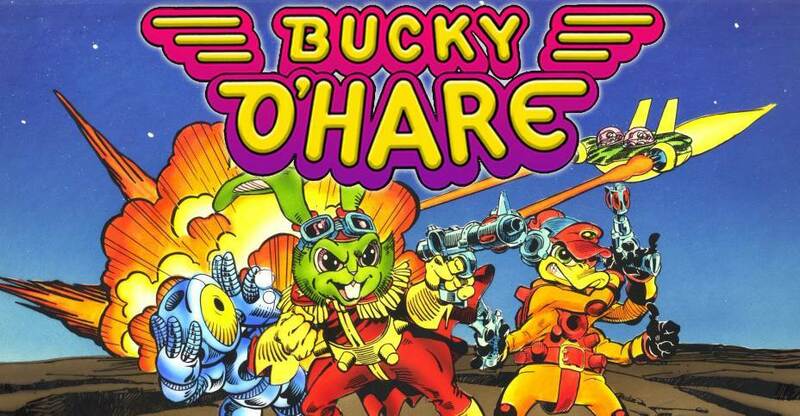 Before I get started, I know Bucky O’Hare existed as a comic about 5 years before the Turtles comic even came out. But if it weren’t for the Turtles’ cartoon, I don’t think Bucky would have ever made the step to animation. Of all the cartoons to come in their wake though, I think this one is the best of the bunch. It’s got a serious tone, in the middle of a war between the United Animals Federation and the Toad Empire, with much of the show’s humor coming from their foot soldiers. Bucky pilots the ship, the Righteous Indignation, freeing slaves with his crew. 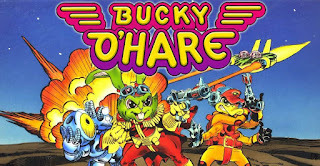 Bucky is a green hare and ace pilot, Deadeye Duck is their gunner that bears a huge resemblance to Daffy except he’s got 4 arms, and Jenny is a telekinetic cat. Where the story loses me though, is when their engineer is lost during a warp drive accident, they open a portal to Earth and recruit a nerdy kid to take his spot. This show would have been way better if Earth wasn’t involved, in my opinion. As soon as I started this show, I not only got that it was inspired by the Turtles but by Bravestarr as well. In fact, not only is the main character played by the same guy that did Bravestarr’s voice (Pat Fraley), he’s using the same exact voice. It’s a Wild West show that takes place on a different planet populated mostly by bipedal cows, though other humanized animals exist there. 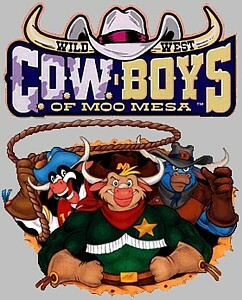 The C.O.W.Boys follow the Code of the West – that’s why the COW is an acronym – which is something they repeat so many times in the first episode I got sick of it. 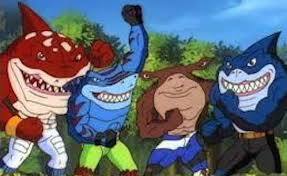 While we got no real intro to the Street Sharks, this show makes sure you know their names by singing a song that introduces them right after the intro song does. While the story isn’t particularly bad, there’s nothing real special here, made worse if you had watched Bravestarr before it. If you looked at the other cartoons on this list, you’d notice most of these cartoons are pretty low-rent. The animation’s adequate, the writing stale, the creativity almost non-existent, but you can’t really expect more than that because none of these are from big studios. But what if someone like WB did one? 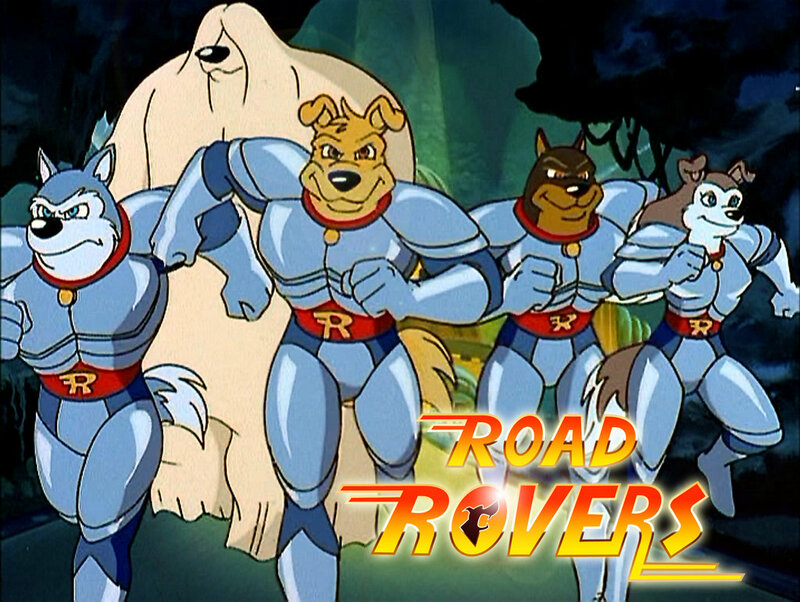 You’d get Road Rovers – a superhero cartoon about dogs that get superpowers and crack a whole lot of jokes. Coming out around the same time as Animaniacs and Tiny Toons, this show obviously doesn’t take itself seriously. Five dogs are summoned by a ghost or angel or something and are sent out to save the world from other dog-related crimes. The characters are all stereotypes or imitations of celebrities, their powers are goofy, and the schemes they prevent are just kinda dumb. But it’s what you expect from the studio that made Freakazoid. It could have taken itself seriously like Disney’s Mighty Ducks, but I'm not sure anyone would have wanted that.